Normal Editions Workshop celebrated its 40th anniversary in 2016. Printmaking Professor Morgan Price (left) and workshop Interim Director Veda Rives are working together on a print in this photograph. This fall, Normal Editions Workshop will celebrate 40 years of collaborative printing with five exhibitions located throughout the Bloomington-Normal community. The first of the exhibitions will open September 9 with a reception from 5–7 p.m. at the McLean County Arts Center. The five exhibitions will include prints from Illinois State University faculty and staff, students, and alumni as well as feature prints from the past four decades. Keeping with the tradition of bringing excellent printmaking to Central Illinois, the international juried exhibition Beyond the Norm will showcase contemporary prints from around the world. Normal Editions Workshop celebrates 40th Anniversary with five fall exhibitions. Sarah Smelser, Veda Rives, and Morgan Price review various proofs with visiting artist Lorraine Shemesh. 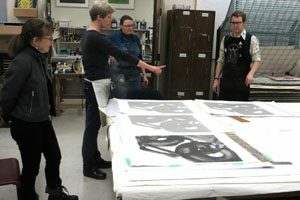 Since 1976, Normal Editions Workshop (NEW) has operated with the mission of bringing outstanding artists to Illinois State University to collaborate in the production of professional editions of prints. During this time, NEW has worked with over 125 artists and completed over 264 projects, including collaborations with noteworthy artists such as Kiki Smith, David Wojnarowicz, John Himmelfarb, and Dennis Oppenheim. A distinctive nonprofit print research facility adjoining the student printmaking studios in the School of Art at the College of Fine Arts, NEW is an outstanding example of an intersection between education and fine art printing that places professionals and students together in an exciting, productive interaction that goes far beyond the usual classroom. Artists of regional, national, and international reputation visit Illinois State University and collaborate with the NEW faculty, staff, and students to produce original limited edition works. For more information, contact Normal Editions Workshop at normaleditionsworkshop@ilstu.edu or (309) 438-7530 or visit NormalEditions.IllinoisState.edu. NEW is located in the Center for the Visual Arts building on the south side of campus.